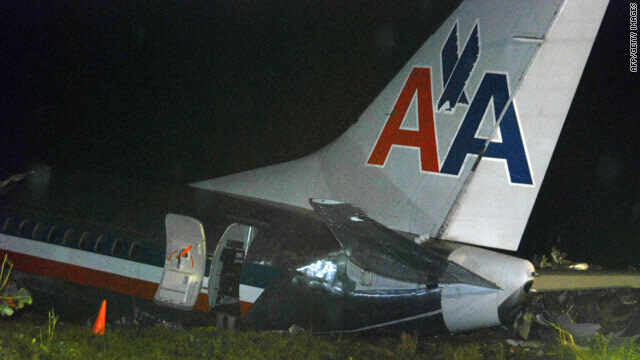 An American Airlines jet overshoots a runway Tuesday in Kingston, Jamaica. Washington (CNN) -- Investigators are reviewing the flight data recorder from American Airlines Flight 331, the plane that overran a runway this week near Kingston, Jamaica, and crashed into a fence. A National Transportation Safety Board spokesman said Thursday that the recorder arrived in the agency's Washington laboratory overnight. Crews continue to look for the cockpit voice recorder. The flight originated from Ronald Reagan Washington National Airport in Arlington, Virginia, and landed in Miami, Florida, before heading to Jamaica, the airline said. It had been raining Tuesday when the plane failed to stop and ran into a fence past the end of the runway, Radio Jamaica reporter Kirk Abraham said. Ninety-one people were taken to three area hospitals, where most were evaluated and released, an American Airlines spokesman said. Ten were admitted, he said, and five remain hospitalized Thursday afternoon. The flight was carrying 148 passengers and six crew members when it landed in Kingston, the airline said. CNN's Jim Barnett contributed to this report.